Caught On A Whim: Life's a beach. One of our favorite things to do was take long walks along the ocean and gather seashells. It was like treasure hunting. The sand dollars were my favorite, because they were huge! Here's a 'Where's Waldo' moment for you... Can you spot the surfer dude? ;) These guys didn't care that the water was a chilly 60 degrees, they jumped right in to catch those waves. 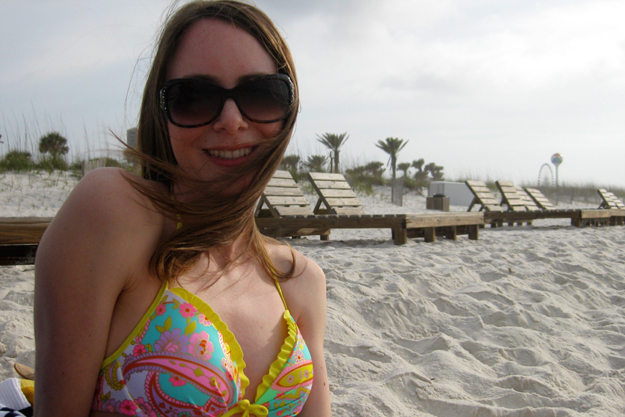 Exploring Pensacola Beach was a lot of fun. We came across punchy beach houses, unique sea life and ate gobs and gobs (boy, did we eat a LOT) of delicious seafood. The view from our balcony was ahhhhmazing! I'm an early riser, so I didn't miss a single sunrise. We practically had the beach to ourselves since we missed the spring breakers and arrived before the summer rush. See, I did wear my bikini... goosebumps and all! This wilted rose in the sand looked so poetic that I had to capture the image. I keep creating stories in my head as to how it got there... a romantic proposal on the beach maybe?! I loved spending so much time with this guy! The highlight of the trip for him was definitely visiting an the National Navy Aviation Museum where we tested out Blue Angels and even tried a flight simulator! I brought a few seashells home, so at least I have a bit of the ocean with me. Of course, now that I'm back I've got lots of time for making new DIYs! Stay tuned. Do you guys have any fun vacation plans coming up?